January 1906 saw the start of regular operation of motor buses by the Bristol Tramways & Carriage Co. Ltd. It is fitting that 100 years later, in 2006 some sort of celebration should happen to mark the occasion. This video records three such events that took place during 2006. The first was at a school in Brislington, Bristol the home town of Bristol Commercial Vehicles who built many fine vehicles proudly displaying the ‘Bristol’ badge. We join the celebration on board a former Bristol Omnibus Bristol MW 2934 (924 AHY) on a run into Bristol. There are more rides to savour, one on Bristol KSW C8320 (UHY 360) where we run through the city centre and up the famous Park Street, turning at the Victoria Rooms for the run back to Brislington. There are plenty of interior and exterior shots of this fine vehicle as we used two cameras to capture all the atmosphere. Another city centre run is completed on the MW, when we call in at the splendid Temple Meads station forecourt, just as these vehicles would have done in the 1960’s and 70’s. Next is a run out on the BCV Test Route to Keynsham on board the beautifully restored prototype Bristol LSX, 2800 (NHU 2). Again experience the sights and sounds of this unique vehicle. We leave this event on board the MW as the light fades on a sunny but cold January day. Our second celebration is at the Harbourside rally in May. 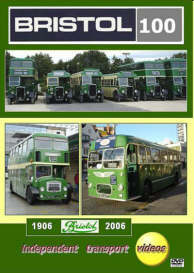 Here there is a gathering of many former Bristol Omnibus vehicles in their original and later liveries. Our nostalgic ride here is on Bristol Lodekka LD L8515 (969 EHW) in the livery of Bath Services. We recreate the number 1 service to Westbury-on-Trym with plenty of atmosphere you might feel you are transported back 35 years or so! Our third and final celebration is a rally in August at the Brislington Park & Ride site. Again there is a vast collection of Bristol Omnibus and other former Tilling fleets operating busy schedules at this interesting rally organised by the Bristol Vintage Bus Group in conjunction with the Avon Valley Railway. An excellent day that cumulates in a record breaking line-up of 15 exposed-radiator Bristols! This video is a must for the Bristol ECW devotee.